Kayla Boiter has lived in South Carolina all of her life. 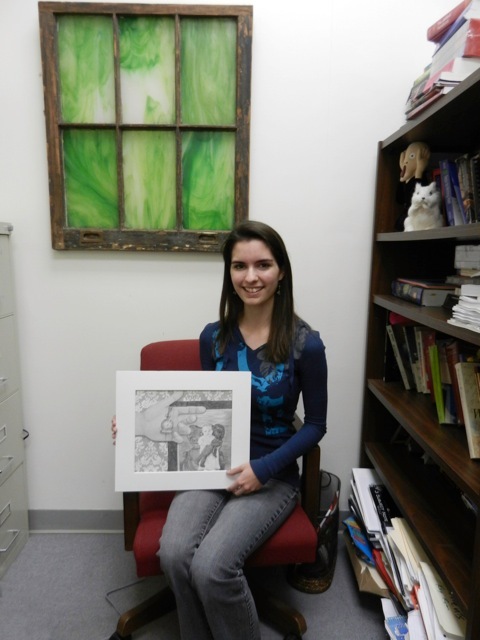 She is a recent graduate of Landrum High School where she was the only AP student to graduate in her class. (She says that no one else was interested in being Art AP). Known as the “artistic student” at Landrum High, Kayla was inspired by her mother who used to design art classes for Kayla and her brother at home when they were growing up. She and her brother even had a special wall in their house where they could practice drawing. Kayla has been attending Greenville Tech for five semesters and hopes to be accepted into the Dental Program in the fall. Kayla says that artistically, she is attracted to realism and portraiture. She has two drawings that are currently appearing in the Blue Granite Review, and when asked about their significance she says “Timeless” is a drawing of a photo of her great grandmother when she was a baby. The drawing also contains Kayla’s own hand holding a watch that belonged to her grandmother, so three generations of women in her family are represented. “Roots and Wings” is inspired by the work of Gabriel Moreno and is an experiment using portraiture (her mother and herself) with graphic images. Welcome to Blue Granite Review, an online literary and visual arts journal for students at Greenville Technical College to exhibit their best creative work.